Since 2009, this site with the URL ukulele-perspective.com has been active. Its URL is now https://ukuleleperspective.wordpress.com From time to time, I may still add something, but these days my other blog is where I will spend most of my time. Do you love music? It seems such a generic question. Who doesn’t. Do you like to make music? Now that’s a more complex question with considerations of how (exactly) and why. But if you own a ukulele, you have probably found, you love to make music with the ukulele. I had always been trying to find the path to the ukulele. I just didn’t know it for many years. 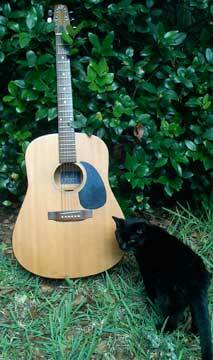 The story starts with: as long as I could remember I had always wanted to play the guitar. When I was 11, my father bought me a guitar for about $15 in Tijuana, Mx where we were visiting the tourist area while on vacation. With a teach-yourself Mel Bay book, I practiced “Lightly Row” and other easy songs until my fingertips were numb. A last look at my Seagull guitar. I bought one of the first Canadian Seagull guitars when they came out with great promotional pricing. The low action and slim neck were great for my short fingers. But after I saw Jake Shimabukuro play “Guitar Gently Weeps” on YouTube, I sold the Seagull because it took up too much room and I hadn’t played it in ages. Somewhere I had a soprano and a baritone Harmony ukulele. Unfortunately, the baritone was cracked and the soprano couldn’t be tuned. It was Christmas 2006 and beneath the tree was a mango flea for me. With its easy-to-hold neck and in tune, loud-enough sound, I began to comb the Web for tabs, YouTube instructional videos, and ukulele music. I couldn’t put flea down. And still can’t. For the past three years it has been a joy to watch, read, follow and learn about the ukulele from the Web. But now, having had the experience of building a ukulele with a great luthier, having attended the Portland Ukefest 2009, and having read and practiced a many songs, (even performed on a few stages) it is time to give back. What I share is what the ukulele has brought to me. It is, to be sure, a Ukulele Perspective. I see things differently with a ukulele. And that has been helpful. I hope to get to know many more people who will share their Ukulele Perspective here. This is a new journey with a ukulele perspective. As we travel, we’ll strum on. The photo in the first banner of UP (Ukulele Perspective) was taken in Smoky Mountain National Park, Tennessee. The Cades Cove Loop, in the park, is a 12 mile road through fields and old homesteads. 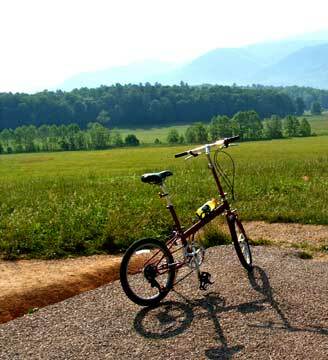 The best way to experience the Cades Cove Loop is to cycle, walk or run through it. It is steep but beautiful. Although most people drive through it, I prefer to cycle on mornings when it is closed to traffic. I admit, when the picture of my flea ukulele in the field with the mountains in the background was taken, we were driving the loop. There is an old church on the loop, called “Primitive Baptist Church” with great acoustics. When we drive, we have our instruments with us, and we have played Amazing Grace in that church once with ukuleles, and another time with our Appalachian dulcimers. It is an experience that gives a real sense of how services might have been for those living in the loop years earlier. 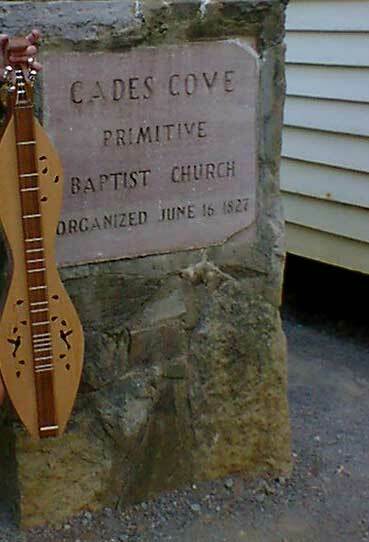 Since the Primitive Baptists did not believe in using instruments (see this post) to accompany their music we were essentially introducing our own idea of how music could have been for them. But they wouldn’t have had ukuleles back then. Nice blog! First time I did visit this one. Thanks Herman. I look forward to reading an English version of your blog. I will enjoy reading of what you are doing. Thanks for adding me! I will do my best to make an English version on day! Am almost a “geezer” in human years but a babe in “uke” years. Have been ukeing for about four years and am convinced this is IT! It’s even emboldened me to a point that I don’t mind stepping up to the mike and singing which I opted out of for my first 68 years. There’s big fun in this little instrument. Good job, thanks for your efforts. Bill, Thanks for sharing. Wouldn’t you agree that the young in spirit are attracted to the little ukulele — which in turn makes us more youthful? I enjoyed this NPR article, “Never too late to learn an instrument” and hope I will always believe this. I restarted with the ukulele in 2006 too! My first uke arrived when I was eleven (sadly, it and its friends were much neglected for 37 years). Glad you enjoyed my version of Rickett’s Hornpipe. How/where did you come across it? Was looking for versions of the hornpipe on iTunes. Most enjoyable listening. 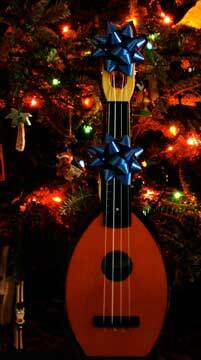 My first uke was a Flea. Then I saw a YouTube video of Friends Of Old Puppy and I simply had to have a Risa electric stick. Nice blog! Love your blog! :) Found it as your post appeared in my tag surfer this morning.